So a while ago I first heard about Sketch in London. I didn’t need to hear much before I was searching the internet for Sketch London reviews and soaking up every picture and article that I could find. Not to mention a full scale stalk of all their social media, which meant that I had instantly fallen in love with Sketch – albeit from afar. I waited for the perfect opportunity to visit, waiting for a special occasion as I wanted to make sure my first visit was one to remember. The opportunity arose over the Easter Bank Holiday weekend as a change of plans meant that the previously planned trip for my best friend’s birthday had to be cancelled. I instantly knew that Sketch was going to be the perfect place to celebrate her (belated) birthday. In the week leading up to our visit, I sent her snaps from the Sketch Instagram page to tease her with where we were going – it was my little surprise for her. 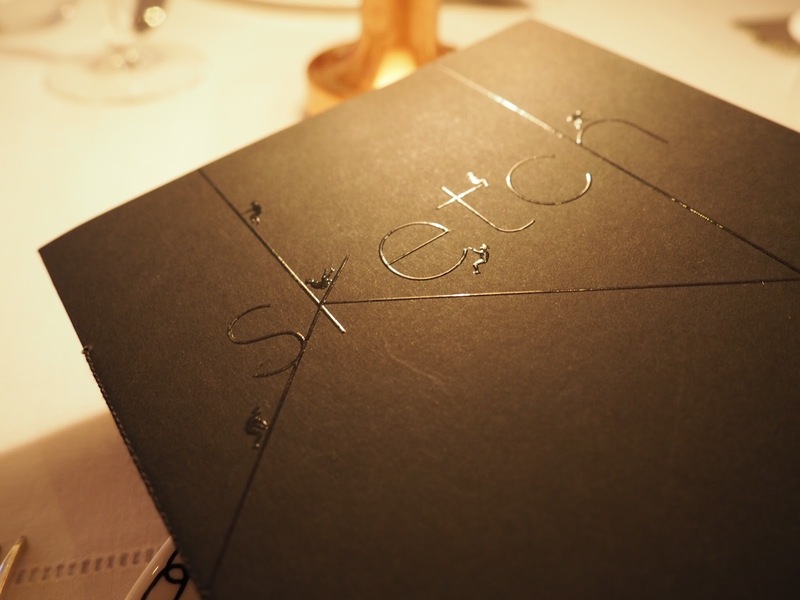 If you’ve not heard of Sketch before, think creative, eclective and quirky. It’s a London Tea Room, Restaurant and Cocktail Bar and it’s reputation of being a sought after destination is every bit deserved. Housed in a 18th century townhouse, as you arrive you’re greeted with a black-out curtain which can seem daunting, but actually adds to the mood lighting and wonderfully themed decor inside – which screams of Mad Men and everything from that era. You instantly get a buzz of excitement as you walk in. Located just a short walk from Hamleys on Conduit Street, Sketch is easy to get to and we had no problems in finding it. Living in Cambridgeshire, I love to hop on a train and spend time in London when I get the chance and after a quick train journey to Kings Cross we grabbed a tube to Oxford Circus and after a five minute walk we were there. We had booked Afternoon Tea, which was the Easter themed version as our visit was on Easter Monday. This was held in The Gallery, a wonderfully atmospheric room with a dome style roof and wonderfully plush booths and seating areas. As we entered The Gallery, we were blown away at the intricacy of detail that had been given to every element of decor. As I said, think Mad Men – it was like stepping into a set from the TV show! The walls are lined with brilliant and hilarious, almost propaganda style artwork from David Shrigley. All of which perfectly compliment the pink and monochrome interior. It’s got this classic and elegant feel, with a bit of tongue-in-cheek fun thanks to the artwork. The low lighting was accompanied by a live singer (who’s voice was impeccable) and added to a relaxed and calming atmosphere, which of course was every bit as quirky and exciting as expected. We were seated in a booth that gave us a great view, and spent the first few minutes just gazing around and taking it all in. Like I said, it’s a total eye-candy room, there’s so much to look at and soak up! 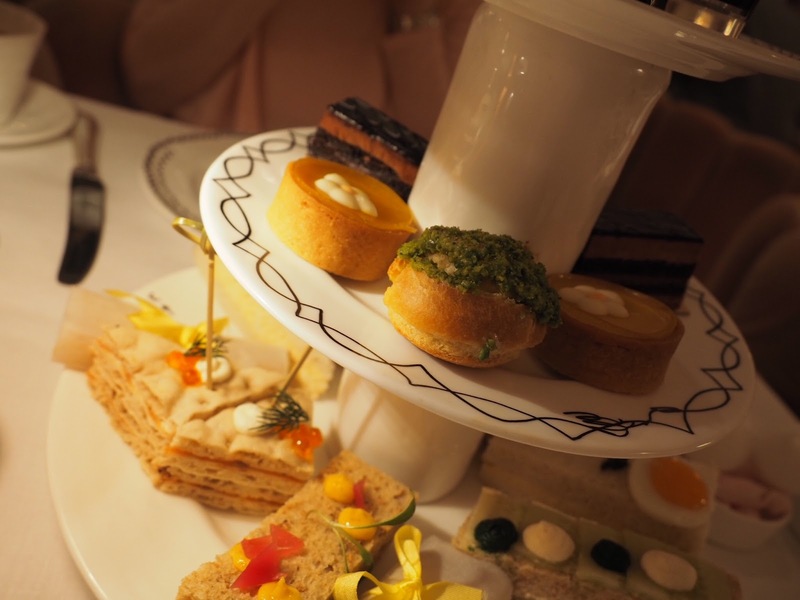 The package we had booked was for Champagne Afternoon Tea, and after a few minutes a member of staff came to explain everything to us, and let us know how the Afternoon Tea was going to work. 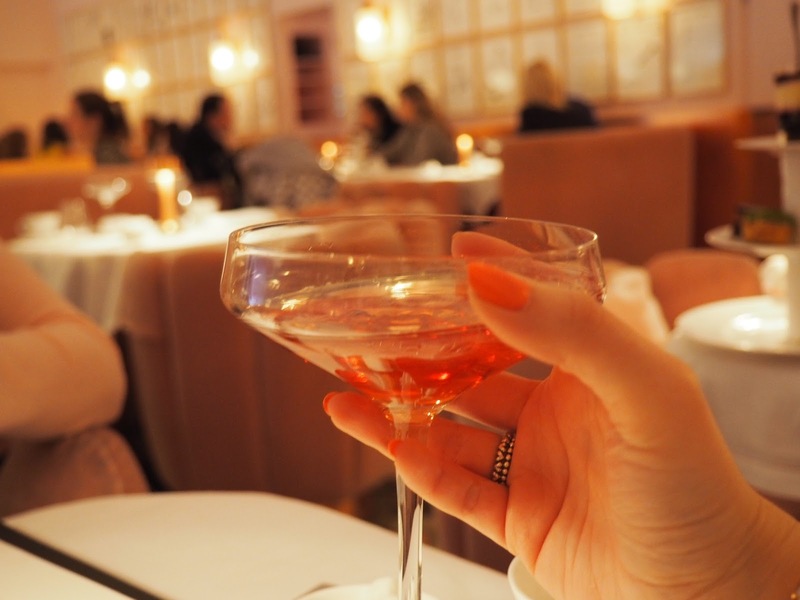 He then proceeded to pour our champagne in the most theatrical way, pure showmanship – and both my best friend and I were in love with the whole thing! He was brilliant, professional and made us feel like we were royalty. In fact, every member of staff who served us during our visit was equally as flawless in service and communication. Although they were busy, we were regularly asked if we needed anything etc. but not to the level that it was overbearing. It was just the right amount of caring service to deserve full customer service marks. But hey, back to the food… So, included in the Easter Afternoon Tea was of course, the champagne. But also included, was an unlimited supply of tea. But not just any tea, there was a whole double page in the menu dedicated to tea options. As both my best friend and I are complete tea lovers, this was fantastic and we were spoilt for choice. The cutest part of the tea experience had to be the actual tea set. 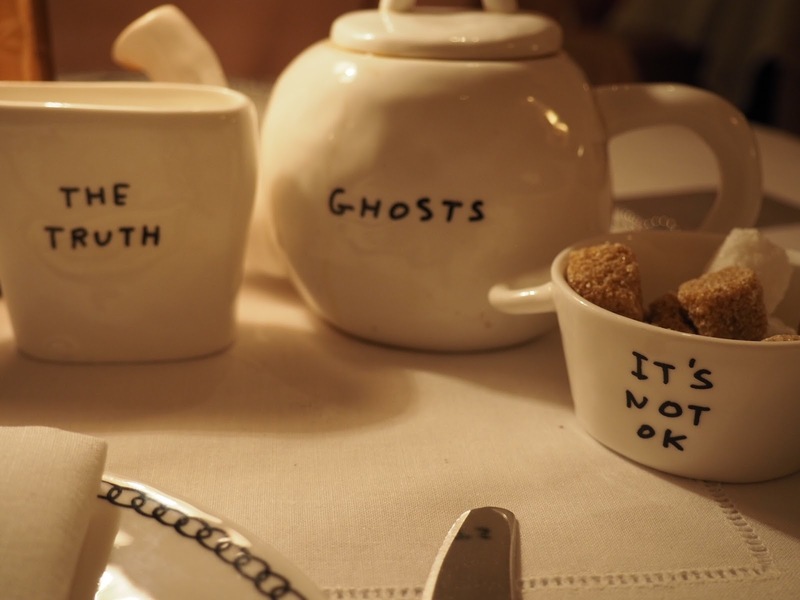 I am in LOVE with this tea set! The perfectly white and simple teapot, tea cup, sugar bowl and milk jug has the most chic and sophisticated vibe with it’s almost narrative style writing. And again, just reinforces how every attention to detail has been made, even in the smallest of things at Sketch. This tea set has made my current lust-list and I’m hoping that Santa thinks I’ve been a good enough girl to deliver one of these underneath my tree this year! But we had absolutely no reason to be anything other than completely blown away. 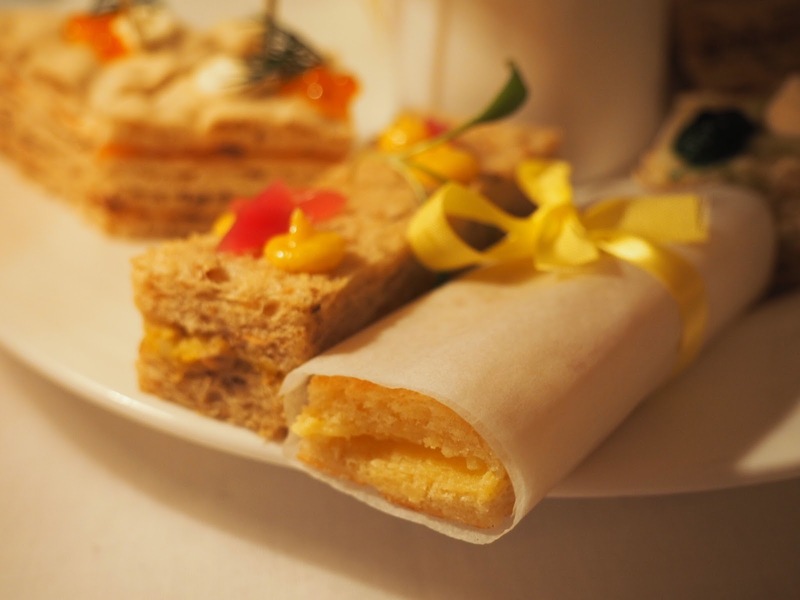 The Afternoon Tea includes a selection of sandwiches, cakes, pastries and a scone. It’s all served perfectly on a beautiful cake stand and is a sight for sore eyes. (Insert heart eyes emoji here) Firstly the sandwiches were absolutely beautiful, perfect, and put my sandwich making skills to shame. The most noticeable was the egg sandwich which comes served with caviar and an actual egg yolk on top. Oh HELLO high-end egg sandwich, you’re my new best friend! Both my best friend and I agreed we couldn’t even pick a favourite sandwich as they were all so tasty. Nothing bland, perfectly combining flavours, if I had to chose the top rating, I couldn’t… Although the toasted sandwich finger, which came wrapped in paper with a beautiful bow was a close contender. Oh the sweets! I could practically salivate at the memory! A gorgeous mass of different flavours from pistachio right through to chocolate, with lemon and everything else in-between. There was a mixture of eclairs, slices, tartlets and more and there wasn’t a single one we didn’t devour and enjoy – such is a testament to the quality of flavours. We genuinely couldn’t pick a favourite, they all exceeded our expectations. The scones were perfect too. After being asked if we wanted a top-up of tea (we did) they asked if we wanted scones with raisins or without. We had one of each. Freshly baked, they came served in a folded napkin with a choice of different jams and clotted cream. Still warm, and scones being a personal favourite of mine, after the gorgeous sandwiches and cakes, this was as close to heaven as food has ever taken me. 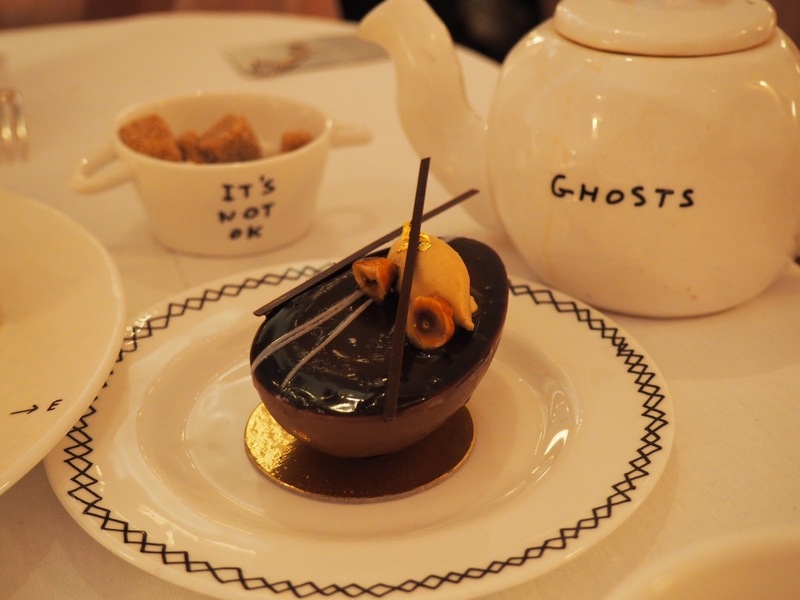 After all that, we were slowly slipping into some sort of food coma, nicely relaxed thanks to the champagne and the added copious amount of gorgeous tea, but we still had one more treat to go – the Easter egg! As a final serving we got to choose an Easter egg, sounds average right? Wrong. These were no ordinary Easter eggs… Half a chocolate egg, filled with a delicious choice of two fillings… My best friend picked the egg filled with passionfruit and chocolate mousse and I went for the chocolate and praline filling. We shared (of course) and both were absolutely on point. They were delicious and the perfect final touch for our wonderful taste experience… even though by the end we were both in a state of food induced euphoria. We took our time, sat chatting and enjoying the surroundings and finishing our tea, and both of us repeatedly said how wonderful the whole experience had been. We couldn’t fault any part of our visit at all. Everything was above expectation and brilliant, and all I’m going to say is that if you go – make sure you visit the toilets… They are egg shaped pods! Surreal and sophisticated, all at the same time… you’ll feel like you’re in a spaceship! Our visit to Sketch exceeded every hope I had. I wanted to do something extra special for my best friend, take her somewhere nice and show her how much I value her friendship. She’s the epitome of a best friend, she’s always there for me – regardless of anything, and she’s more like a sister than a friend. Our visit to Sketch was probably one of the best memories I have with her now, so I can’t thank them enough for providing us with the perfect place to celebrate our friendship. 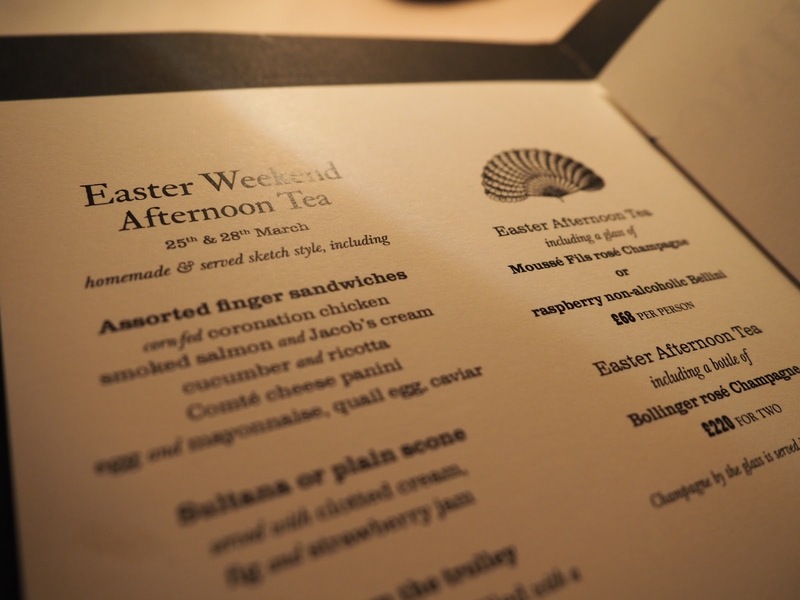 I paid £68 each for our Champagne Easter Afternoon Tea. But the usual everyday price for the same package (minus the egg, and minus being on Easter weekend) is £57. It’s worth every penny because the food is excellent quality and simply delicious, the staff are lovely and the whole experience is brilliant. 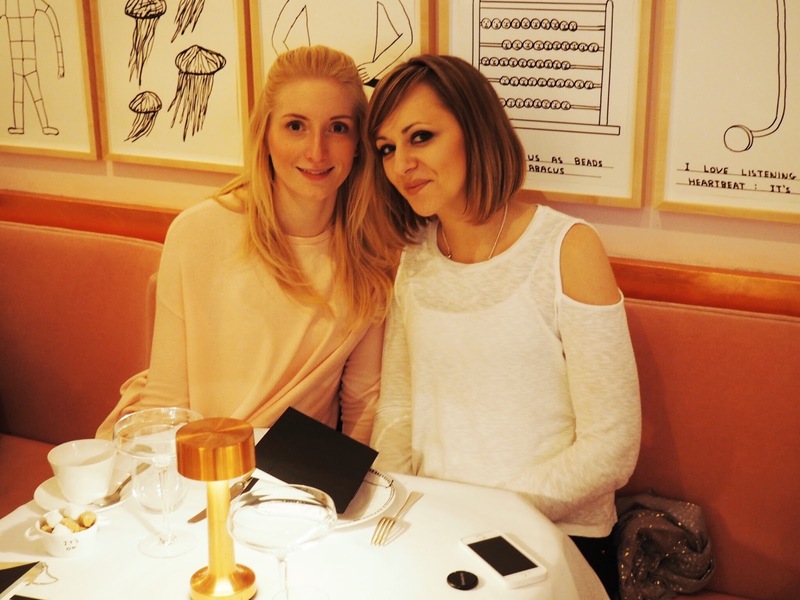 I can honestly say that Afternoon Tea at Sketch is the best Afternoon Tea experience I’ve ever had – and I can’t wait to go back.